It's been awhile since I've done a Friday's Letters and I'm excited to get back into it. Hold me to it! Dear Husband-So SO proud of you on your new job and accomplishments! We love you! Dear weekend- Boo to you and making me work. You better go fast so I can get to my weekend off. Please and thank you. Dear blog-You are in definite need of TLC. I am working on it as we speak. It all starts with the perfect new name then I can really vamp up the design. And splash all wedding pictures everywhere. Dear Powerball-I am so sad we didn't even win a piece of the pie. I mean, we could do some serious damage with even a half a mil. What you say, next time? 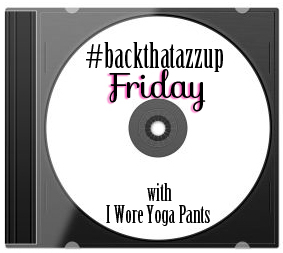 Also, you better be ready to #backthatazzup. It's a good one. Florida Georgia Line+ Nelly = They must be in my head because I could rap Nelly like it was my job back in the day. OR still can. Hey! Found you through Whitney's hop. I'm a fellow newlywed, excited to start checking out everything you did leading up to your beautiful wedding to get ready for my reception.